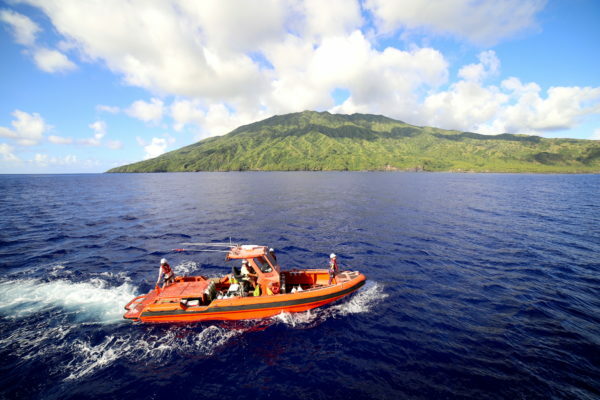 100 Island challenge team member Chris Sullivan recently accompanied NOAA’s Coral Reef Ecosystem Program (CREP) on their Mariana Archipelago Reef Assessment and Monitoring Program scientific expedition across the Northern most islands of the archipelago. This is Chris’s second time visiting the Marianas as part of CREP’s efforts. Although the islands are stunning above the water, it seemed as though there was a notable change below water. Our team will investigate these observations as part of the 100 Island Challenge. Together, the team visited a total of 9 islands including Saipan, Sarigan, Guguan, Alamagan, Pagan, Agrihan, Asuncion, Maug, and Farallon de Pajaros. The expedition took place over the course of 26 days at sea aboard the NOAA ship R/V Hi’ialakai. 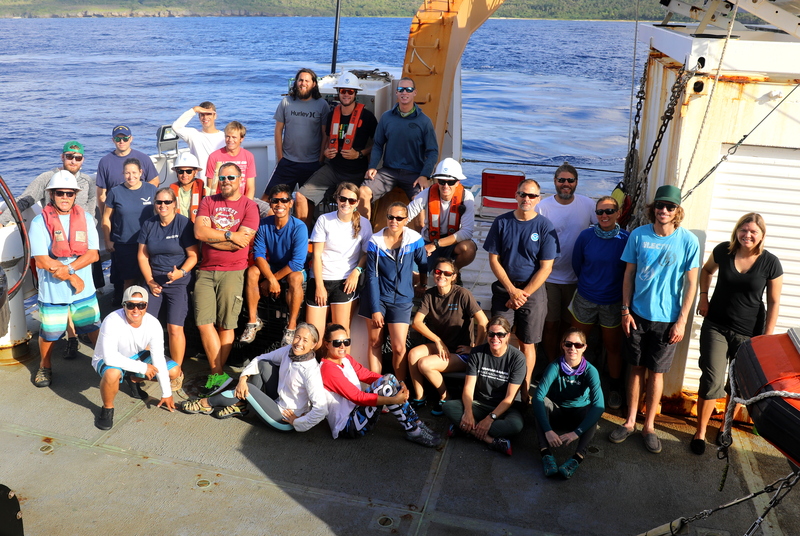 The partnership between the 100 Island Challenge and NOAA CREP has been ongoing for several years and creates great opportunities to document the structure and function of coral reefs. The scientists at CREP collect a large suite of data including reef fish surveys, benthic cover and demographic surveys, towed-diver surveys of large fish and benthic cover, subsurface temperature recorders (STRs), autonomous reef monitoring structures (ARMS), calcification accretion units (CAUs), bioerosion monitoring units (BMUs), inshore and offshore TA/DIC water samples and CTD casts, and water sampling for the full microbial suite. The 100IC contributes to this effort by collecting photomosaic benthic surveys. On this expedition, the team was able to collect 64 photomosaic surveys, which results in 6400 m2 of reef area surveyed! Importantly, the team re-visited mosaic plots that we surveyed initially in 2014. 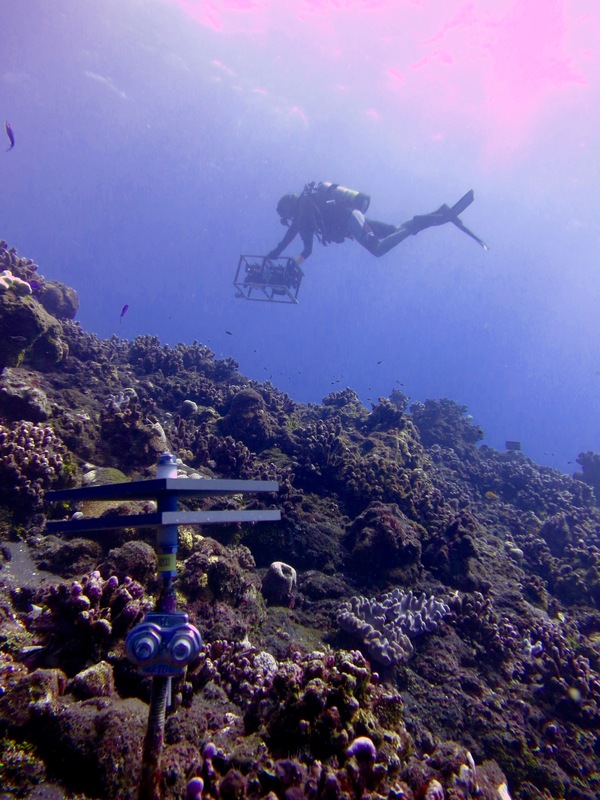 These data will allow our team to track the fate of corals at Maug through time. Over the course of 21 days of diving, Chris logged 75 dives while completing mosaic surveys and helping the CREP Ocean and Climate Change and Benthic teams with their surveys and instrumentation. This type of output could not be accomplished without the help of the experienced field scientists at CREP and the 100IC team cannot thank them enough.